February 2011 Archives - Newman Dignan & Sheerar, Inc. - Providence Fee-Based Financial Advisors February 2011 Archives - Newman Dignan & Sheerar, Inc. Global markets were faced with geopolitical unrest out of the Middle East, sending all US equity indices lower for the week. These concerns also drove crude oil markets higher, raised inflation concerns and caused US GDP forecasts to be trimmed. As we said last week, corrections will likely be bought by investors, who will be moving out of cash and bonds and into equities. This week could be a bumpy ride for equities as investors shift their focus to Friday’s employment report. The markets edged higher last week on continued positive economic news. We saw improving ISM and labor market data. A sharp increase in farm prices has not yet reached the retail level, and we suspect that margins at US companies will begin to compress as they are not able to pass along higher input costs. Sentiment remains fairly strong, and we see the markets moving higher after a brief pull-back that is due any day now. Perhaps the unrest in the Middle East along with higher oil prices will be the catalyst for a market pull-back. Any sustained correction will likely be bought by investors moving out of cash and bonds and into equities. This week could be a bumpy ride for equity investors. The stock market climbing a wall of worry is a term we often hear to describe a market that is going up despite a number of fundamental problems. 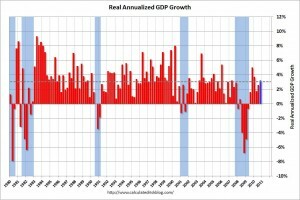 While we agree that there are serious issues to deal with, the basic health of the U.S. economy has improved significantly in the last eighteen months. 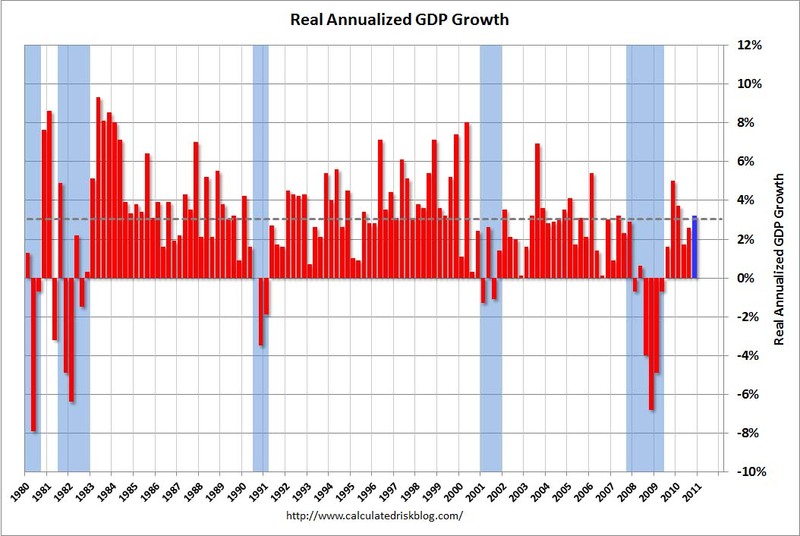 Forecasters now see the US growing 3-4% in 2011 with corporate profits up 12-15%. The market is now at 13.8 times those earnings, not unreasonable historically. We would urge you to focus on these basics and not be overwhelmed by the national debt problem, food inflation and the continuing bad news we hear about global unrest. Keep the focus on the U.S. economy and the market’s valuation relative to those corporate earnings and you can feel comfortable on the wall of worry. Remember too that unemployment is a lagging indicator that will improve later in the cycle. Markets continued to power ahead last week, with the Nasdaq advancing 3.1%, while the S&P was up 2.7% and even the DJIA was up 2.3%. Earnings reports, led by firms like Exxon Mobil and Pfizer, are still providing positive surprise. Egyptian unrest continues, but meetings with protest groups [including the Muslim Brotherhood!] and the Egyptian vice president Suleiman seem to be defusing the situation [for now]. The payroll survey produced conflicting numbers [weather and data restructuring]. We’ll have to wait for next month’s numbers for a clearer employment picture.